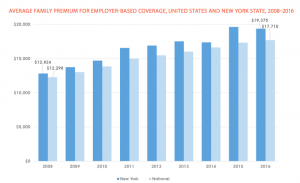 As Albany lawmakers consider imposing costly new taxes and mandates on health insurance, a report from the New York State Health Foundation offers a timely reminder: The state’s premiums are already among the highest in the country, and rising fast. The state’s average family premium in 2016 was the third highest in the country at $19,375. Its average single premium was fifth highest at $6,614. From 2008 through 2016, premiums for employer-sponsored plans increased at more than double the rate of the median household income. These findings dovetail with a December 2017 report by the United Hospital Fund, which documented a 35 percent drop in New York’s small-group enrollment, from 1.7 million to 1.1 million, over the past decade. This trend, it warned, was “likely exacerbated by rising premiums.” It also makes the goal of universal coverage that much harder to reach. Rather than trying to solve these problems, Governor Cuomo and the Legislature are debating steps that could only make them worse. Cuomo is proposing two additional taxes on health care—a 14 percent surcharge on the underwriting gains of for-profit insurance companies, and a 2 cents-per-milligram tax on prescription opioids. Directly or indirectly, both would inevitably push insurance rates higher. The governor further aims to seize billions in proceeds from the planned takeover of the non-profit Fidelis Cares health plan by the for-profit insurance company Centene. 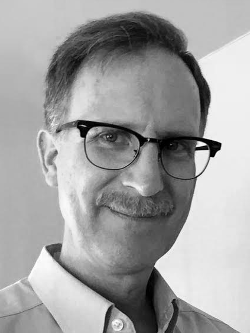 He would put part of the money into a health care “shortfall fund” to be used in case of future revenue losses—a tacit acknowledgement that the state does not need the funds as of now. All of these measures would be piled on top of $4 billion-plus in health insurance taxes imposed through the Health Care Reform Act—which are the state’s third largest source of revenue. This push for additional health taxes is predicated on the idea that New York’s health funding is under attack in Washington. But none of the threatened cuts has actually become law, and Congress’ most recent votes have restored or continued billions in aid that otherwise would have lapsed. As a result, New York’s already generous level of federal health aid is rising, not falling. The state’s Essential Plan, which covers low-income New Yorkers, is projected to run a hefty surplus, which Cuomo is using to plug holes elsewhere in his budget. Another premium-boosting provision in the governor’s budget calls for the state Department of Financial Services to study whether insurers should be required to pay for in vitro fertilization. That would be a particularly expensive addition to Albany’s long list of coverage mandates. While Republican leaders in Congress are still contemplating cuts to Medicaid and other programs, that crisis remains theoretical for the time being. The affordability crisis is quite real, as the Health Foundation’s analysis confirms. Legislators should keep that in mind as they rush to their budget deadline. 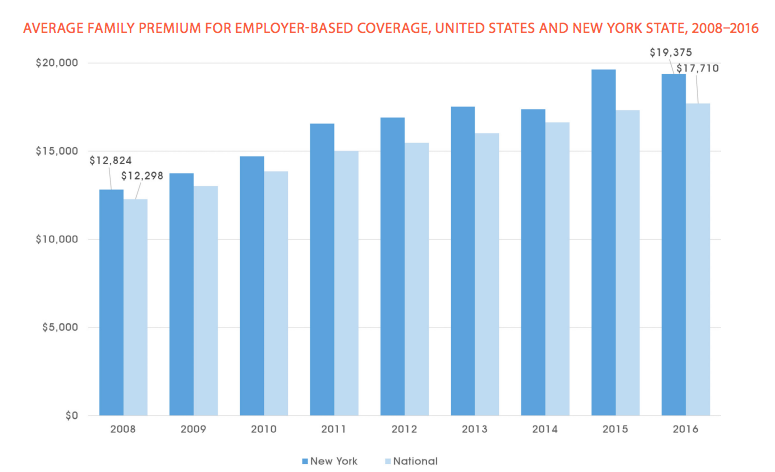 A report from @NYS_Health offers a timely reminder: The state's insurance premiums are among the highest in the country, and rising fast. The real crisis in New York's health care system is not a lack of tax revenue, but a lack of affordability.